Museums today are faced with a number of challenges and are currently searching for ways to attract and retain audiences and engage with the public. In order to address these issues, researchers have called for studies to help construct a more complete understanding of the visitor experience. Few studies employ methodological approaches that provide in-depth accounts of the museum experience. Narrative methodology is one means by which researchers may access rich accounts of the multi-faceted nature of audience relationships with museums. 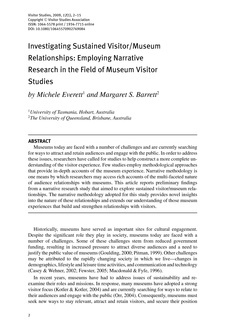 This article reports preliminary findings from a narrative research study that aimed to explore sustained visitor/museum relationships. The narrative methodology adopted for this study provides novel insights into the nature of these relationships and extends our understanding of those museum experiences that build and strengthen relationships with visitors.